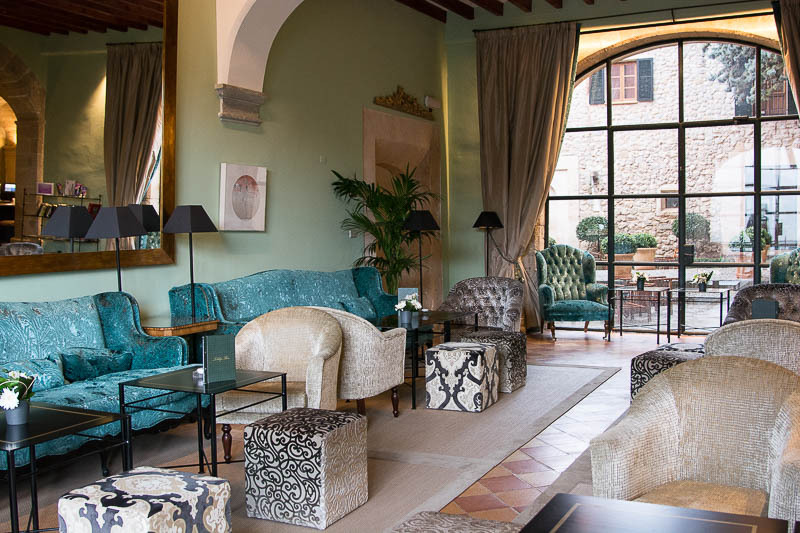 Last November on this blog, I wrote that in the Condé Nast Johansens Awards, the 5-star Gran Hotel Son Net in Puigpunyent had been voted ‘Best for Romance Hotel in Europe and the Mediterranean Region’. So, what better opportunity to put it to the test than a combined Valentine’s Day and anniversary celebration? Receptionist Daniel greeted us warmly and, having completed the brief formalities of checking into a hotel in Spain, asked if we’d like a drink outside. We hot-footed it out to the large terrace, claimed two comfortable chairs and, moments later, two glasses of bubbles arrived. The chimney room lounge, leading to the terrace. Mid-afternoon on February 14th we could feel the warmth of the sun on our faces and soak up one of Mallorca’s best hotel terrace views – which takes in the small village of Puigpunyent down in the valley and soaring UNESCO World Heritage Site mountains of the Serra Tramuntana. 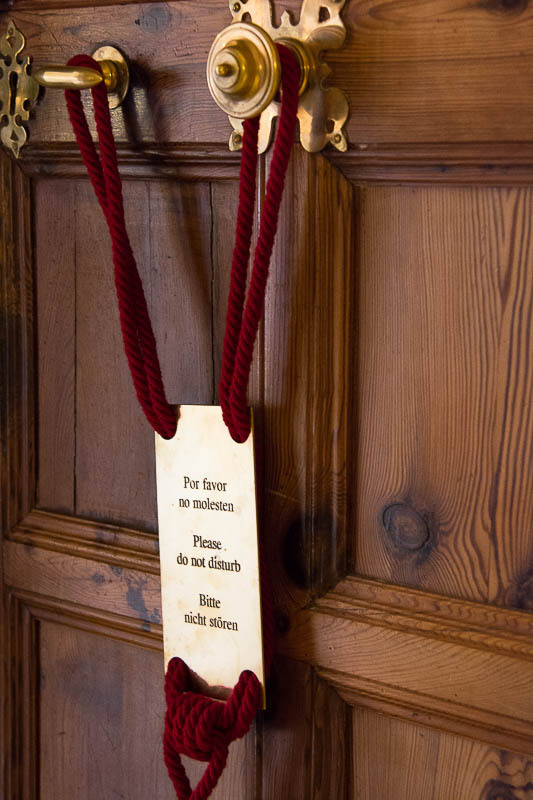 The hotel is part of one of the oldest estates on Mallorca, and Son Net’s location and history alone are enough to ramp up the romance factor. We eventually tore ourselves away from the terrace to go to our room, the newly refurbished Jaime III suite, which has a huge private terrace (would be good to be there in summer). No fewer than three rooms – plus large bathroom – were ours for the night. The overall area of the suite was probably about the size of our finca home on Mallorca! If only we could have stayed for more than one night. Or moved in permanently . . . Despite the grand proportions of the suite, our accommodation was blissfully warm – something we really appreciated when the weather changed dramatically later. There’s a certain romance about being warm and snuggled up to a loved one when a gale is howling and rain is lashing outside. We had a huge comfortable bed, plenty of pillows, and soft duvet. A chaise-longue-style couch in the corner of the bedroom provided a spot to curl up for a post-cava snooze for a while before we showered and dressed for dinner. A comfortable place for two to relax. Somewhere to pen a love letter or poem inspired by the beauty of the surroundings. Sitting room with colour-cordinated coffee table books! Just one part of the spacious bathroom. The bathroom was superb – all creamy marble and light blue Italian stucco walls – with spacious cubicle (ooh, room for two – that’s romantic), large whirlpool bath, his’n’hers sinks, and cubicle with loo and bidet. The deliciously scented Occitane toiletries worked for male and female guests. The built-in bathrooms were also in this room, and concealed useful stuff such as bathrobes, safe, umbrella, and enough drawers, hanging space and hangers even for those who pack the entire contents of their wardrobe for a few nights away from home. And so to dinner at Oleum Restaurant. . .
I’d been looking forward to dinner in Gran Hotel Son Net’s Oleum Restaurant as a new chef had joined since I had had lunch there last spring. Oleum still houses the original olive press and, although the space is large, it manages to feel intimate at the same time. We sat in a corner with a great view of the whole restaurant, on a plush velvet banquette that was so tactile I couldn’t stop stroking it! As many hotel and restaurant chefs do for Valentine’s, new executive chef Christian Coll had created a special menu for dinner. It began with an amuse bouche of oyster in curry and coffee sauce. Although that sounded innovative, neither of us likes oysters – even though they are known for their aphrodisiac qualities. When we explained this, we were immediately offered a prawn alternative – which was a promising start to dinner. We enjoyed the dishes we chose from the menu and the pleasant friendly service (with a special mention for waiter Mauricio). We look forward to tasting more of the Mallorcan chef’s food in the future. The generous and varied breakfast at Gran Hotel Son Net is buffet style, with the additional option of eggs cooked to order. Breakfast in the room was an option on the hotel’s set Valentine’s package, but I do like to see a hotel’s breakfast buffet in full. So there were no toast crumbs under our duvet! Did I mention the Treehouse? Gran Hotel Son Net is, as far as I know, the only hotel on Mallorca with a treehouse. And it’s not the type of treehouse your dad might have built as a kids’ play space at the bottom of the garden. This one is the setting for the hotel’s romantic treehouse dinners (four courses for 150 euros per person; seven courses for 190 euros per person). We haven’t eaten in this lofty space, but I imagine it would make a memorable place for a marriage proposal or special anniversary celebration. Even after only one night at Gran Hotel Son Net, it’s fair to say that all the boxes were ticked for my own vision of a romantic getaway. Other guests clearly have felt the same way for the Condé Nast Johansens Awards to name it ‘Best for Romance Hotel in Europe and the Mediterranean Region’.